During the Vietnam war it took North Vietnamese soldiers sometimes five months, marching 8 to 12 hours a day, to travel from Hanoi in North Vietnam down the Ho Chi Minh trail to the war zone north of Saigon. The Communist soldiers would carry enormous loads of ammunition on their bony shoulders over the jungle-clad hills and mountains under constant American bombardment. Their rations were balls of rice. They sang a song about the sandals protecting their feet. They were made from rubber tyres. "Their heels are thin and their straps supple and lasting like love," they sang. Fast forward to today. While adventurous western tourists are riding motorbikes down the same legendary trails where these horrendous wartime journeys were made, bumping through jungle once scarred by airstrikes and artillery fire, the authorities are turning parts into a new national highway with package tours to sites of old battlefields. Whereas in war, Communist North Vietnam equipped its fighters with these crude sandals made from rubber tyres, in peace the reunified nation of North and South Vietnam has become the promised land of the international shoe industry. During the first nine months of this year, Vietnam's leather and footwear exports jumped by 30 per cent to $4.8 billion. Vietnam is the world's biggest cashew-nut exporter and the second largest exporter of coffee and rice. Accession to the World Trade Organisation in 2007 opened up large sectors of its economy to foreign investors and exporters and overhauled most of its trade and investment laws. Lately there has been a revision downwards of Vietnam's economic prospects. Deep-rooted problems of corruption, abuse of power, poor education and infrastructure, overlooked in the boom years, have come to the fore. Soaring inflation has driven up wages while labour skills are lagging behind. A huge state-run shipping conglomerate has gone bankrupt and a thrice-devalued dong is fuelling the black market. But Vietnam, which has been successful in picking up a manufacturing base that used to be in China, is still classed as one of the most promising new emerging markets, a powerful long-term investment opportunity despite some loss of trust. Americans who once said that Vietnam had a curse on it are increasingly engaged economically and strategically with their old foe. Despite the downturn, businessmen are flocking to Vietnam, setting up offices and factories, playing on the golf courses, hitting the beaches, dining at great but inexpensive restaurants. In an industrial zone north of Saigon, the name by which people still call Ho Chi Minh city, Intel has invested $1 billion in a plant that includes a testing facility and an assembly line turning out microprocessors and chipsets for semiconductors for its global supply chain. The 500,000 sq ft plant is the most striking feature of a sprawling industrial park on land that was once a huge US military base. If the prospect of a giant American company investing so heavily in Vietnam was "unimaginable even ten years ago, let alone 40 years ago," as Secretary of State Hillary Clinton noted when the plant opened late last year, the prospect of the US supporting Vietnam with military power might seem still more far-fetched. President Barack Obama signalled that possibility in November, however when he sealed a new bilateral defence deal with Australia's Prime Minister Julia Gillard to boost regional security. Under the agreement up to 2,500 US Marines will eventually be stationed in the north of Australia for six months every year. The full US Marine air-ground task force will be the biggest US military deployment in Australia since World War Two. Its purpose is to reassure China's neighbours including Vietnam which have found themselves in an increasingly tense confrontation with Beijing over rival claims to the waters of the South China Sea. As America pivots towards Asia after years of warfare in Iraq and Afghanistan, China, Hanoi 's ally during the Vietnam War, now confronts Vietnam in a nasty dispute for control of these resource-rich waters. 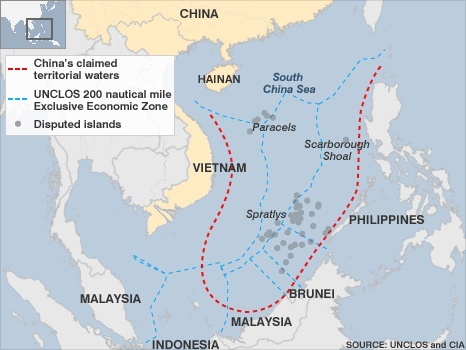 China's has backed up its territorial claims in waters from Vietnam to the Philippines and Japan with growing military spending and a dramatic naval expansion. As a result, worried neighbours, including America's old foe Vietnam that fought a border war with China in 1979, are increasingly looking to the US to maintain a strong military presence. A deal is close to stationing US warships in Singapore and, to China's irritation, American navy ships have recently conducted joint training exercises with Vietnam, itself. The phenomenon of budding military cooperation between the US and Vietnam parallels the renaissance of Vietnam as an essentially capitalist state within a socialist system. After maintaining tight controls in the decade after defeating the US-backed Saigon regime in April 1975, Vietnam woke up in 1986 to the need for "doi moi," renovation. Ever since, despite the corruption, bureaucratic meddling and frequent complaints, all compounded by inflation, the pattern is still that of increasing economic freedom as long as no one questions the power of the Communist regime. "Our policy is to put aside the past and look to the future," said Colonel Nguyen Van Bach of the Veterans' Association. "The victory was a victory of the whole nation." People in Saigon need no better reminder of the need to stick to business and leave policy to the conquerors. If Ho Chi Minh City dominates the economy, no one forgets that Hanoi, 950 miles to the north, remains the centre of power – and final dispenser of fear and favour. A major task of the Ho Chi Minh People's Committee and the local branch of the ruling party is to breathe inspiration and loyalty into a southern population that would prefer to forget the dominance of Hanoi. In that spirit a senior official of the HCM People's Committee dwelled on the vibrancy of a metropolitan region that rivals that of some of the major cities of China in its aggressive pursuit of industrialisation and modernisation. "You can see a lot of changes here," said the official, holding forth in the rococo HCM People's Committee building, that is the French-built city hall, a confection of mansard roofs and gables and marble floors and statuary, at the end of Nguyen Hue Street, which each year is famously flooded with beautiful flowers for the lunar new year festivities of Tet. "We are the most vibrant centre for economic advance," he boasted. We are a city of enormous economic potential with an average economic growth rate of ten percent a year." Befitting its capitalist and colonial past, Ho Chi Minh knows well how to exploit the economic liberalisation the Communists have allowed. It is at the hub of an expansion drive whose influence and benefits cover all Vietnam. Bursting with at least 9 million people, including 2 million who have moved in from outlying provinces in search of jobs, Ho Chi Minh contributes 21 percent of the country's gross domestic product, 13 percent of the national budget and an astounding 40 percent of the country's export revenue. The changes that have swept Vietnam since "reunification" of North and South on April 30, 1975, are nowhere so clear as in the relationship between modern Vietnam and South Korea. The paradox of Communist Vietnam's enormous relations with capitalist South Korea was evident in the visit to Seoul in early November of Vietnam 's President Truong San Sang. The image of South Korea 's highly conservative, arch-capitalist President Lee Myung-bak, smiling as he and the Vietnam president clasped hands, flashed on the front pages of the Korean media without a passing note of the irony. If the presidents of Korea and Vietnam were mindful of their nation's recent wars, they avoided the topic in meetings that solidified a tremendous economic relationship. Indeed South Korea may be Vietnam 's best friend in Asia. As unstated as the memory of the wars fought by both countries, the former the ally of the Americans, the other the deadly enemy of the US, is the common cause they now share against a foreign behemoth much closer at hand: China. With its claims to varying degrees of sovereignty over the large bodies of water lapping up on Chinese shores in both Southeast and Northeast Asia, China has repeatedly tried to put the Vietnamese in their place when it comes to the South China Sea. And the Chinese have responded with indignant outcries whenever the US Navy sends its warships there, or to the Yellow Sea around South Korea, in a show of force against China's protectorate, North Korea. For their part, South Korea and Vietnam have come up with an ''overall joint proposed plan'' under which South Korea would supply Vietnam with two nuclear energy reactors. Korea 's 21 nuclear reactors provide 30% of its electrical power, and the country has already concluded a US$20 billion deal for building and installing four nuclear reactors for the United Arab Emirates by the end of the decade. The Vietnam reactors would be of the same design as those for the UAE, and the cost per reactor would probably be the same as well - $10 billion for a pair. The record of South Korea 's role in the Vietnam War, in which more than 5,000 South Koreans were killed, a statistic that compares with more than 58,000 American dead, has receded into largely forgotten history. Korean and Vietnamese leaders have proclaimed 2012, twentieth anniversary of their bilateral relations, ''the year of Korea-Vietnam friendship'' while business people focus on trade approaching $20 billion this year, $24 billion in South Korean investment in Vietnam, more than that of any other country, and upwards of $1 billion in aid to Vietnam. A final deal on nuclear energy reactors would easily top the list of foreign investment in Vietnam. As for the Chinese, they show no sign of entering any bidding wars with their erstwhile ally. The war was cataclysmic but it now seems as if the long nightmare never happened. These days, cars are edging out the motorcycles on widening avenues and new bridges across the Saigon River and, in the delta to the south, across the branches of the Mekong. One American entrepreneur Jim Okuley, running an exercise centre and small restaurant south of the river, can make it to the heart of the city in five minutes through a newly opened tunnel. "About 65 percent of the population is under 30," he estimated. "The only connection they have with the war is through one of their relatives. Their interest is making money and helping their families." Okuley still views modern Vietnam through the prism of the Vietnam War and the rise of free enterprise in a socialist society. He was a crew chief on a C130 transport plane when he first touched down at Tan Son Nhut Air Base in 1969, and the war was still raging when he took off from there for the last time in 1971. He mingles memories old and new from the perspective of the centre that he and his Vietnamese wife established in a district from which guerrillas once fired rockets into the downtown of old Saigon. Having seen Vietnam in war and peace, Okuley prefers to take advantage of all the country has to offer without dwelling on its tragic past. "People in the South were living off sweet potatoes and rice," he said, harking back to his days as an airman more than 40 years ago. "When the government puts up a sign that says, '35 years of peace and prosperity' since 1975, people say, 'Why rock the boat?' This generation essentially is a pretty happy bunch." Okuley's wife, Nicole, whom he met in the US years after she had fled with her parents from the northern port city of Haiphong after the Communist victory over the French in 1954, had a lot to do with setting up the centre in shining new facilities in December 2008. "The biggest business in Vietnam is tourism," he said. "Without exception people include Vietnam as one of their favourite places." The travel writer Tom Harack professed amazement at the profusion of golf courses and luxury hotels. "It's weird to think there would be two golf courses in Danang," he said after visiting the central coast city where US marines first landed in 1965 and which was the site of a huge airbase. People and products routinely cross the borders into Cambodia and Laos. There are fewer and fewer reminders of war. The Cao Dai temple, where I had seen black smoke rising one morning in June 1972 after a South Vietnamese A1 Skyraider showered it with napalm, is freshly painted and festive. The road where the napalmed girl and her little brother ran screaming in terror teams with normal traffic. If the policy of Hanoi is to encourage free enterprise and let the good times roll, however, there is still one major catch: all news and views, everything in print, on the air, in theatres or on the internet, even if non-political, has got to be reviewed and censored. And, of course, there is no bona fide political opposition in a society where the party, which includes the president but is controlled by the general secretary, reigns supreme. Local newspapers focus only on the positive news but beneath the surface there is a lot of anger at the government, especially among younger people. A colleague told me that on a recent trip his bus driver pointed to a flashing Communist symbol over new tollbooth on the Bien Hoa highway and unsolicited muttered, "The Hammer to hit you on the head and the Sickle to cut your throat." The question is whether the people of Ho Chi Minh, and much of the rest of the southern reaches of the country, including the Mekong delta rice bowl, will eventually grow restive under the grip of the conquering northerners. The answer is maybe — but not to the point of a rebellion that would end the boom and result in hardship and suffering reminiscent of the tragedy of the Vietnam War. The very resilience they showed during those bitter years of conflict now seems likely to help them create an economic powerhouse. Jon Swain is an award-winning former foreign correspondent for the Sunday Times who covered the Vietnam War.